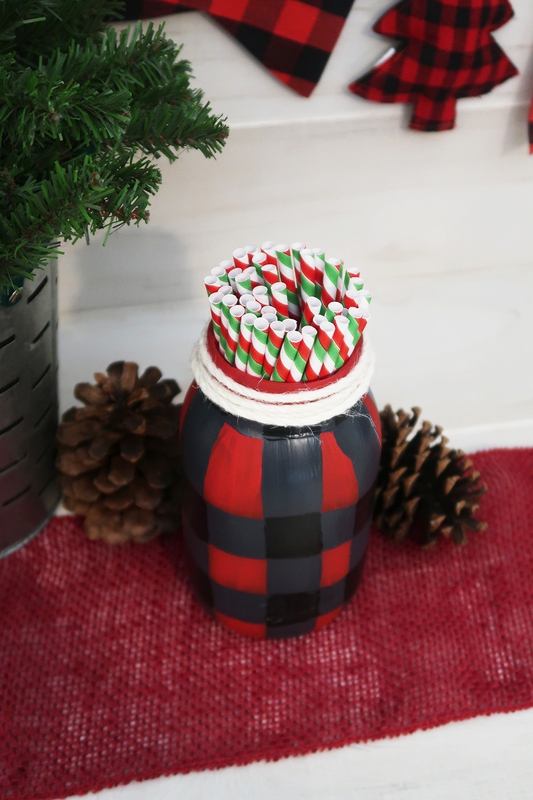 The perfect mason jar craft for Christmas Decor. 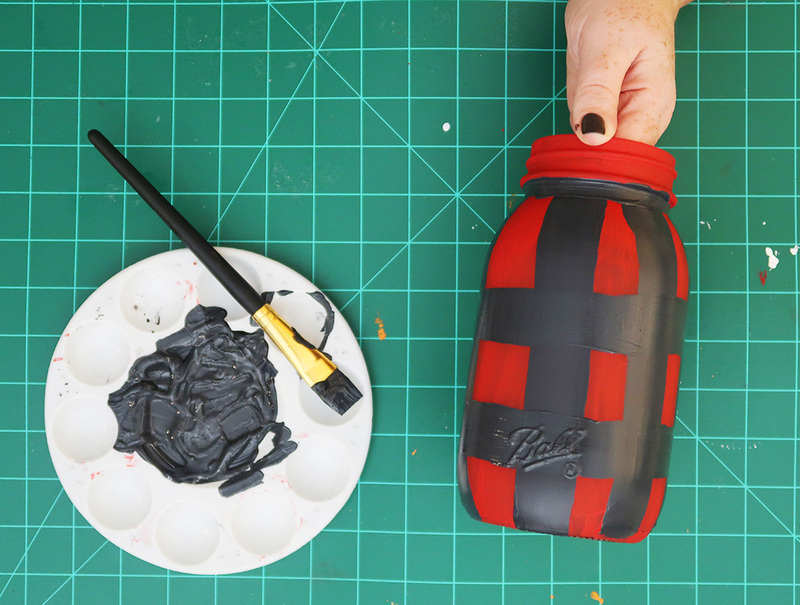 DIY red and black buffalo check painted mason jar. Why not make a red and black buffalo check mason jar?! It’s perfect as a vase or even to hold some utensils at your holiday party. Let’s get started. First thing we want to do is paint our mason jar a solid color. This gives us a base for the buffalo check plaid. I chose to use red chalk paint. To minimize streaks, I always use chalk paint as my base color. Tip for painting a mason jars place your fingers inside the jar and hold it above the surface. I also stop at the bottom edge of the jar in order to place it down to dry. Let paint dry completely. Now to achieve a buffalo check look I am going to use a dark grey and black for the check. I made the grey using black acrylic paint as my base and adding a small amount of white acrylic paint. What I love about these buffalo check painted mason jars is that I free hand paint them. That means they are not perfect. They are a bit more organic or rustic in nature. If you are a perfectionist and want straight lines you could accomplish this with painters’ tape. Using a brush that is about a one-inch wide start at the bottom of jar and paint a straight vertical line to just below the rim on the neck of the jar. Let paint dry completely. Using the same grey paint that you mixed start painting your horizontal stripes. Try to keep the stripes equal distance. Also make sure to paint a horizontal stripe around the mouth of the jar. Now what makes buffalo check is the darker square. It is important that the darker check is where the two stripes cross into a "t". At every T we are going to use a smaller brush to create a square and then fill it in with black paint. To finish this off we are going to add a piece of rope ribbon to the neck of the jar, tying it in the back. Let the paint dry completely and you have a beautiful mason jar vase as a piece of Christmas décor. I absolutely love how this came out. While it’s not perfect that is what makes me love it more. It fits right in with my buffalo check décor and has more than one use. 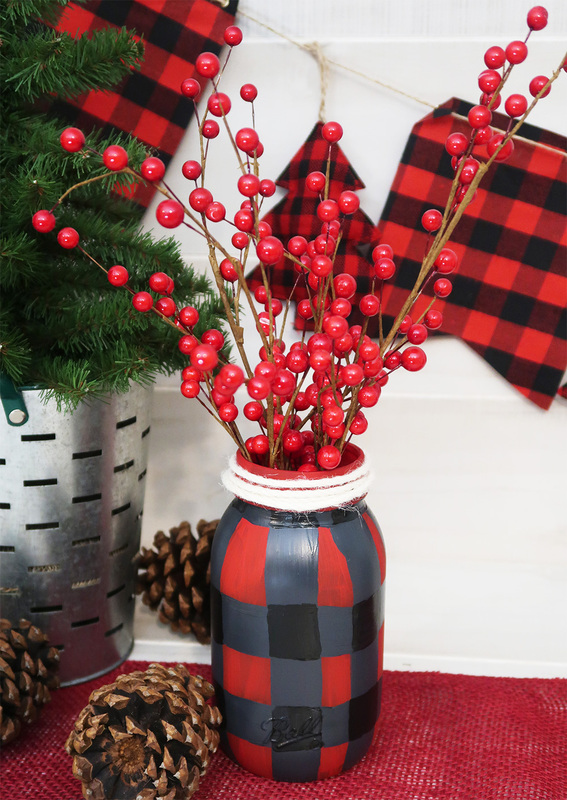 For everyday holiday décor I can add some red berries and use it as a vase. When I have my Christmas party I can add some paper straws or utensils. 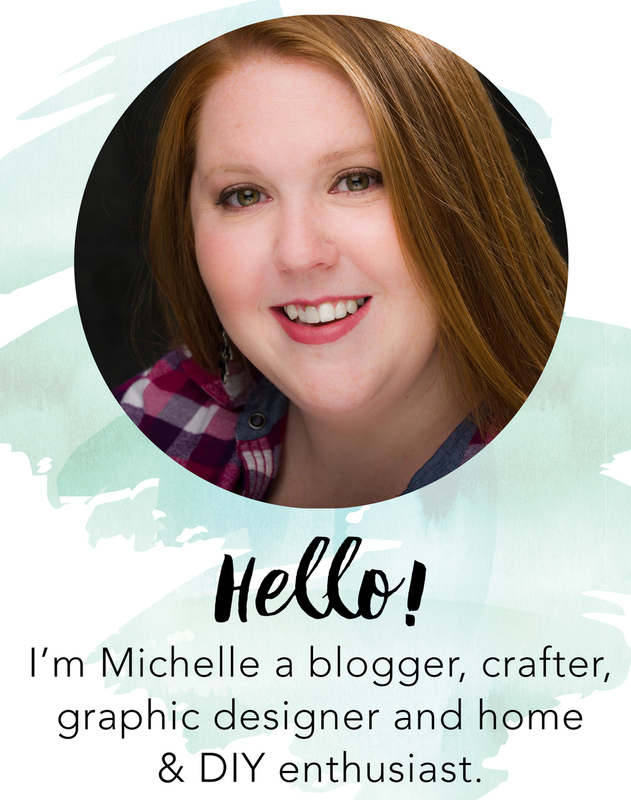 Did you know mason jars are one of my favorite ways to craft for the holidays?